Egg salad can be prepared using different recipes and the number of calories in it varies based on the recipe used to prepare it. This food item is preferred both for its taste as well as the health benefits it offers. 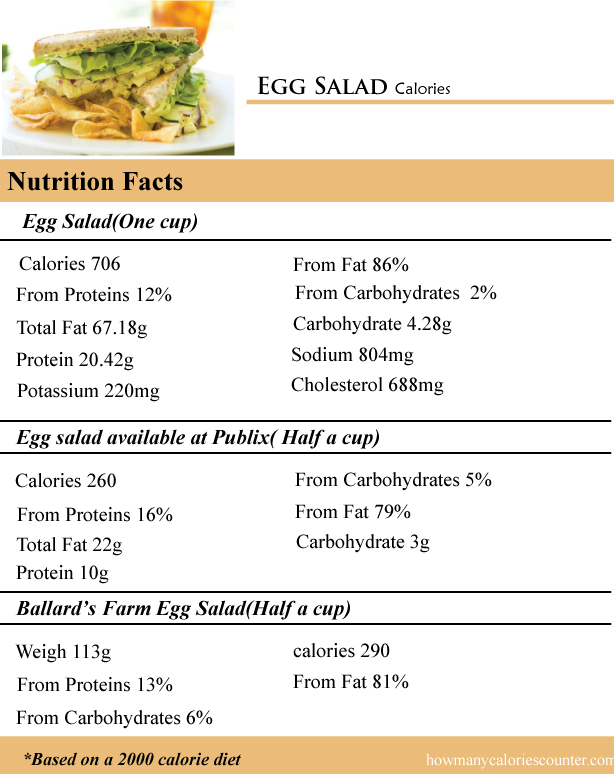 One cup of egg salad prepared using its standard recipe contains 706 calories out of which 86% of the calories are obtained from fat, 12% from proteins and just 2% comes from carbohydrates. The total fat content in an equal quantity of egg salad is 67.18 grams, total carbohydrate content in it is 4.28 grams, protein content is 20.42 grams, sodium content is 804 mg, potassium content is 220 mg and cholesterol content is 688 mg. It also contains essential minerals such as calcium and iron. One oz of similarly prepared egg salad contains 90 calories, a medium serving of egg salad has 216 calories and a large serving of egg salad has 235 calories. You may also opt for commercially prepared egg salad from different brands. Half a cup of Egg salad available at Publix weighing around 100 grams contains 260 calories. Out of these 260 calories 79% of the calories are obtained from fat, 16% calories come from protein and 5% calories come from carbohydrates. The total fat content in an equal serving of Publix egg salad is 22 grams, carbohydrate content in it is 3 grams and protein content is 10 grams. Ballard’s Farm egg salad is equally popular. Half a cup of Ballard’s Farm weighing around 113 grams contains 290 calories. Out of these 290 calories 81% calories come from fat, 13% calories come from proteins and 6% are obtained from carbohydrates. Consuming ¾ cup serving of Fresh & Easy egg salad means taking in 110 calories, out of which 72% calories come from fat and 14% each from proteins and carbohydrates.